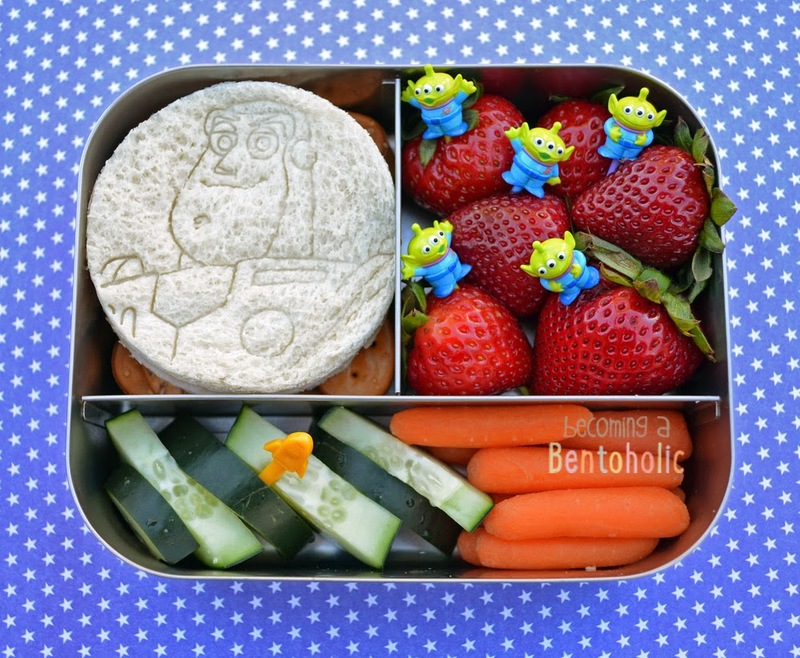 Bento fun today featuring Buzz Lightyear with a "to infinity and beyond" themed lunch. In this lunch: Buzz Lightyear turkey sandwich on top of pretzel crisps, strawberries with alien picks, cucumber slices with a space ship pick, and baby carrots. The Toy Story alien picks were purchased at Tokyo Disney last year (a friend sent them to me). Unfortunately, I have heard reports that they are no longer available there. The Buzz Lightyear cookie cutter is from Disney Cakes & Sweets. If you live in Europe or Australia then you are in luck. You can have this magazine delivered to your door and every issue comes with a fun little tool. I scored my copy with Toy Story cookie cutter set on eBay! While I was watermarking the photo of this bento, I realized that it is the exact same layout as my minion lunch from last week!